A recent discovery of facsimile leaves, printed on vellum in the 1560s to supply a lack in an incunable, nicely illustrates the benefits of collaborative research in the internet era. 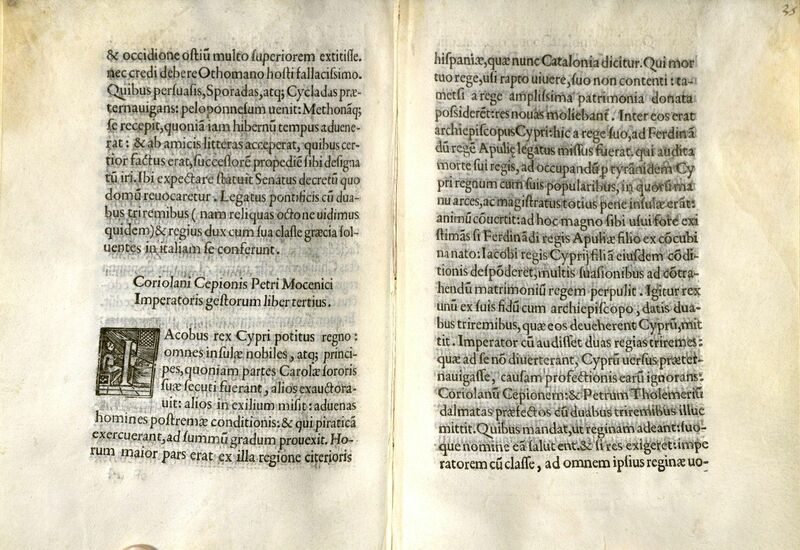 The copy in question is Coriolanus Cepio, Petri Mocenici imperatoris gesta (Venice: Bernhard Maler, Erhard Ratdolt, and Peter Löslein, 1477), Inc 4369 (Walsh 1730; Goff C-378). Renzo, who is working on Erhart Ratdolt, a 15th-century printer in Venice (and later in Augsburg), noticed an anomalous initial in a work printed by Ratdolt and his partners – an initial not like any other he had seen in Ratdolt’s work – as well as other curious features. 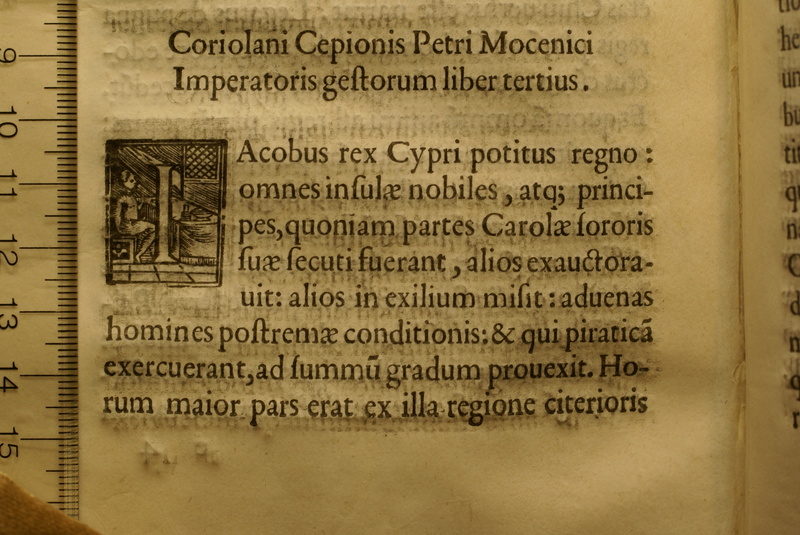 The initial appears on leaf e4v of Cepio’s work; the Houghton copy is a handsome one, printed on vellum. (Only one other vellum copy is known, that from the library of King George III, in the British Library.) Comparison of the Houghton copy with the one digitized by the Bayerische Staatsbibliothek in Munich and linked from ISTC substantiated the first impression, which was then verified by the images of the two copies preserved at the Library of Congress promptly supplied by Daniel DeSimone, the Curator of the Lessing J. Rosenwald Collection. Since Renzo’s current focus is on Ratdolt’s edition of Euclid and its illustrations, he did not pursue the matter, but handed a note about his discovery to the Houghton reading room staff, who passed it on expeditiously. The note soon made its way to John, who was thought to be the appropriate person to follow up. He is working with James Walsh’s monumental catalogue of Harvard’s fifteenth-century books, supplemented by his own observations, to add information about each copy to a union data base, Material Evidence in Incunabula (MEI), sponsored by the Consortium of European Research Libraries. That resource brings together records of a variety of evidence for the history of individual copies – provenance, rubrication, illumination, annotation, binding, and the like. The edition of Cepio’s work is a quarto gathered in eights. The leaves in quesition, e4 and e5, are a conjugate bifolium at the center of a gathering. John noted (as Renzo had, though without having mentioned it in his note) that the type with which leaves e4 and e5 were printed was different from that used in the rest of the volume, though it was close enough that it would not have been apparent to the casual reader. The following week, John and Renzo happened to be in the Houghton reading room at the same time, viewed the volume again, and agreed that the type appeared to be somewhat later than that used by Ratdolt, based on the forms of certain characters. Also, Renzo pointed out that there was a blind impression of the type of the outer forme (e4r-e5v), slightly out of register with the inked text, and John noticed that there are two faint appearances of the text on the inner forme (e4v-e5r), also out of register, but apparently without an impression into the vellum. At this point, it seemed clear that the leaves had been added at a later date, replacing the original leaves, which may have been lost or damaged (there is some damage to a couple of other leaves in the volume). But we couldn’t go any further. Thanks to Houghton’s enlightened photography policy, John was immediately able to take a few photographs (with his trusty pocket-size Canon camera, which has macro capability and high resolution), and send them off to Oliver at the headquarters of the Gesamtkatalog der Wiegendrucke, a central node for all things incunabular. In the past, Oliver had worked wonders in type identification, and he came through again. The initial was used in Venetian books of the 1560s. According to the brilliant catalogue of the Inconaboli & Cinquecentine … della Bibliotheca Capitolare d’Ivera, ed. by Bruno Giglio and Ilo Vignono (Bologna, 1989), No. 220, it was used in: Javelli, Giovanni Crisostomo. Diuinae et christianae moralis philosophiae institutiones. Venice: Andrea Arrivabene, 1566, fol. 25v. The larger type, used in the prologue of this work, seems to be the type of your bifolium. But the type was—and the initial may have been—used by more than one printer. So, my guess is, that the bifolium was printed in Venice c. 1565, but it would be very daring to identify the printer. 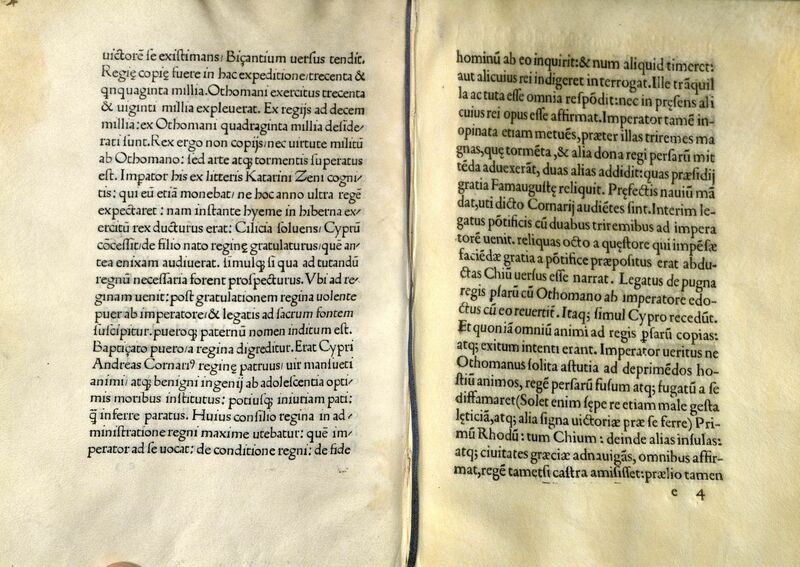 As there seems to be no Latin edition of the Cepio in the 1560s, I suppose, that the bifolium was indeed a 16th century attempt to fix the imperfect copy, rather than part of a lost page-by-page reprint of the older Ratdolt edition. 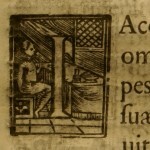 This appears to be a rare survival – there are many instances of lacunae in copies of incunabula being filled by manuscript insertions, and a few instances of much later typeset leaves being provided for the purpose, when incunabula (even copies on paper) had become almost completely collectibles rather than books to be read, but casual inquiry among a few knowledgeable friends has not elicited any other instances of 16th-century type-facsimile completion of an imperfect volume. If any readers of this account know of one, please let us know! Unfortunately, there are no clues to the early ownership. The volume was rebound in the 19th century (albeit quite handsomely) in full green morocco, edges gilt, with yellow silk doublures, probably for Sir John H. Thorold, whose Syston Park bookplate is in the volume. In the sale of his library in 1884, the volume sold for £5/10/-; it was purchased by Harvard in 1918. Postscript: John mentioned the find to Eric White, Curator of Special Collections at Bridwell Library at Southern Methodist University, a leading scholar of incunabula. Eric responded shortly thereafter with a citation to what seems almost certainly a reference to this copy in 1824, mentioning the reprinted leaves. 80. Coriolani Cepionis de rebus gestis Petri Mocenici libri III. Venetiis, Bernardus Pictor et Erhardus Ratdolt, 1477, petit in-4. Un autre exemplaire, avec deux feuillets réimprimés, se trouve indiqué dans la Catalogue des Livres de MM. Payne et Foss, 1824, in-8. p. 131, no. 2819. So it would seem that what was known to a careful observer almost two hundred years ago was lost in the meantime, only to be rediscovered in the 21st century.